Bacon flavor and fresh breath? You bet! 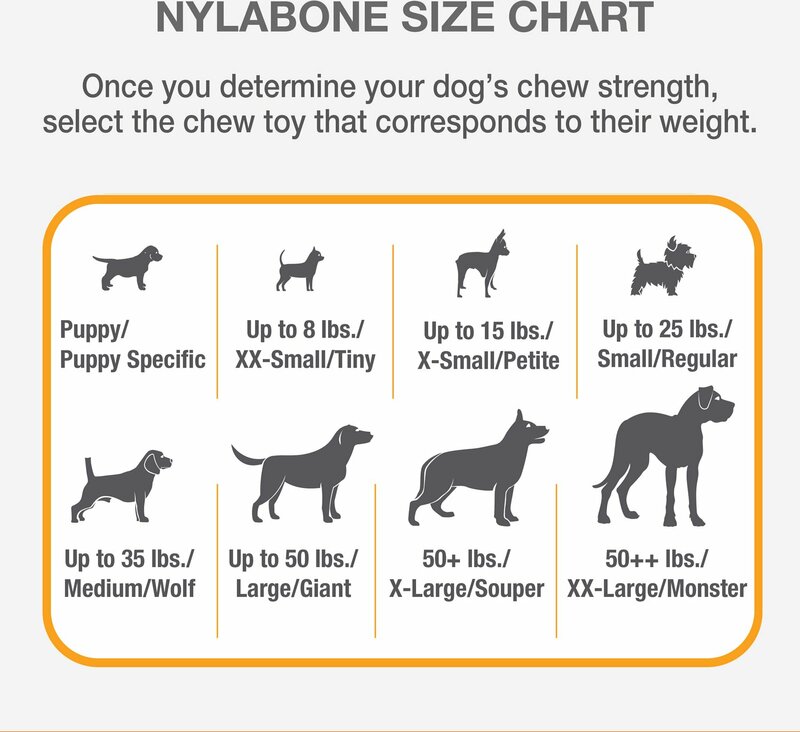 The Nylabone Double Action Chew Bone Dog Toy gives you and your pup the best of both worlds, satisfying his need to chew and your need to keep bad breath at bay. The ends of the toy have a tempting bacon flavor, and the soft middle has a fresh minty scent for bad breath control. 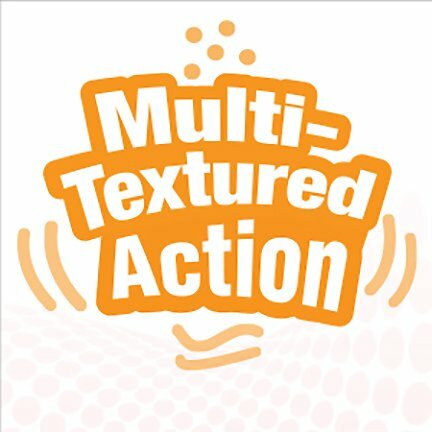 Double Action Chews have tiny bristle-like projections that control tartar, massages his gums, and keep his chompers clean. Dental nubs help clean teeth, massage gums and reduce tartar while your pet chews and gnaws away. Minty center freshens doggy breath making kisses much more enjoyable and a bacon flavored outside make this an irresistible toy for any pet. Durable construction for lasting use so you can help keep your pet entertained and encourage safe, healthy chewing habits that save shoes and furniture from destructive chewing. 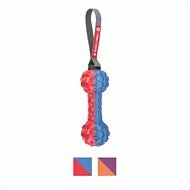 The unique design makes this toy easy for your pup to carry around since they can grip the center effortlessly. I have a 2-year old pit bull who chews through EVERYTHING I buy him other than his Kong Ball which is not much for playing with but more for putting snacks in. This bone has occupied him so well, and cleans around his teeth and gums. I almost forgot to mention that he has NOT been able to destroy the bone! LOVE IT! You definitely get your monies worth with this bone. My GSD likes to rip off the green section of the bone.. I have, what you might call a power chewer and he has practically chewed off all of the middle green section of this bone. I'm assuming it's safe if ingested, but I'm finding green pieces all over the house. I like the size and weight of the bone for him, but be careful if dropped on a bare toe!! He has not even started chewing on either end of the bone - too consumed with tearing the green section off! It's a little large for her right now at 6 months and 6lbs. Not a lot of interest in it. I'm hoping that at full size that will change. I can't really give it a bad review because I ordered a chewie that is too large for her. I have a Tibetan Mastiff who chews on everything and destroys anything in moments. The DuraChew has been a lifesaver for my furniture, and it freshens his breath! Just remember- pay attention to the size and toughness guidelines given. They are very accurate and helpful in finding the right toy for your dog breed. My French bulldog seems to enjoy this toy.. so far she hasn't been able to destroy it.. which I'd a good sign. The only thing negative I would say is the toy is hard/ when it drops to the floor it always sounds like something is going to break.. Lasted my heavy-chewer 35 days. My 40-lb, adult dog is a heavy chewer... He loves hard toys though, so we go through them pretty quickly. This one lasted him 35 days. I would say this was moderate compared to other toys. Got the wolf size due to the weight that it says its's good for and I think it's too big. My pup is trying to to bite it because he LOVES the smell of it. My dog was able to chew through the green color of the bone within 15 minutes, so now we have all sorts of small green items on our floor. I was hoping for something more durable. I have quite a few Nylabones that my 3 mini schnauzers really like. For some reason, they never pick this one up. They sniff it and then go to another one. I have no idea why. I gave it 4 stars because it's well made and other dogs may love it.